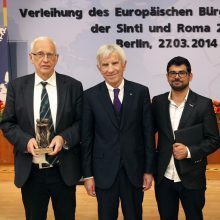 The European Civil Rights Prize of the Sinti and Roma is sponsored by the Manfred Lautenschläger Foundation and was established in November 2007 to mark the tenth anniversary of the founding of the Documentation Centre of German Sinti and Roma. It was awarded for the first time in December 2008. 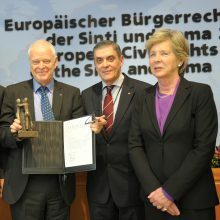 Against the backdrop of an extremely alarming human rights situation for the Sinti and Roma in many European states – especially in eastern and south-eastern Europe – the prize is designed to help with the implementation of civil rights for members of the Sinti and Roma minorities in their respective home countries. The prize is also to be seen as a signal to politicians, the media and social groups to take action against deeply rooted antigypsyist structures of prejudice so that the everyday marginalisation of the minority can gradually be overcome. The prize honours individuals, groups or institutions primarily from the majority population who have chosen to face up to their historical responsibilities and have been exemplary in calling for an improvement in the human rights situation of the Sinti and Roma, their involvement in society, and their equality of opportunity. 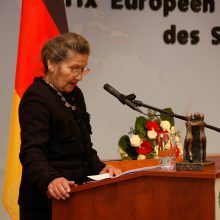 Past laureates include the former Polish Minister of Foreign Affairs, Władysław Bartoszewski, the former President of the European Parliament, Simone Veil, the former Council of Europe Commissioner for Human Rights, Thomas Hammarberg, and the president of the Society for Threatened Peoples, Tilman Zülch. In 2016 the prize was awarded at the European Parliament in Strasbourg for the first time. The laureate was the human rights organisation Amnesty International, which for many years has been actively involved in combating discrimination against minorities in all areas of life.